Liftmaster CSW200101UL Swing Gate Oeperator - Buy Liftmaster CSW200101UL Swing Gate Operator Online. The Liftmaster CSW200101UL is a commercial AC pad mount gate operator. It is appropriate for use on High-Traffic commercial swing gates. Buy Liftmaster CSW200101UL Swing Gate Operator Online. The Liftmaster CSW200101UL is a commercial AC pad mount gate operator. It is appropriate for use on High-Traffic commercial swing gates. The Liftmaster CSW200101UL is a commercial AC pad mount gate operator. It is appropriate for use on High-Traffic commercial swing gate applications, both single and dual, and supports wireless dual gate communication. The Liftmaster CSW200101UL supports gates that do not exceed 18 ft or 1600 lbs. It also supports sites that require 115V. Buy Liftmaster LA400PKGUL Swing Gate Opener online. The new Liftmaster LA400PKGUL swing gate operator is UL 325 compliant and compatible with monitored safety entrapment protection devices. Buy Liftmaster LA400PKGUL Swing Gate Openers Online. The new Liftmaster LA400PKGUL swing gate operator is UL 325 compliant and compatible with monitored safety entrapment protection devices. Buy Liftmaster LA412PKGUL Swing Gate Openers Online. 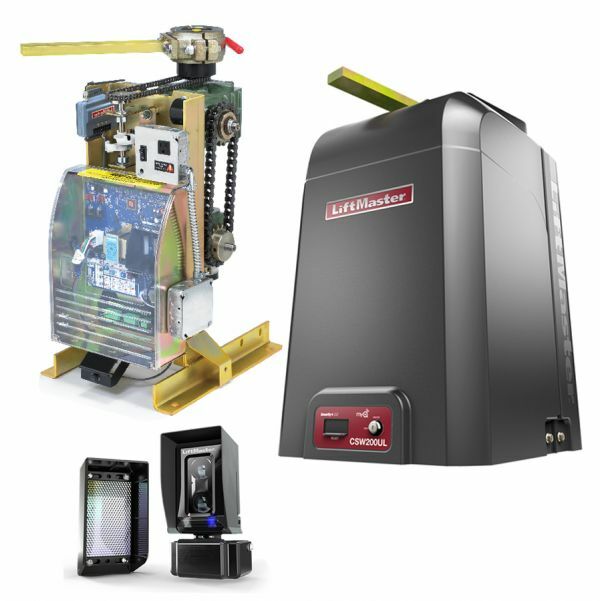 The new Liftmaster LA412PKGUL swing gate operator is UL 325 compliant and includes a monitored safety entrapment protection device. Buy Liftmaster LA500PKGUL Swing Gate Opener Online. The new Liftmaster LA500PKGUL swing gate operator is UL 325 compliant and compatible with monitored safety entrapment protection devices. Buy Liftmaster LA500PKGUL Swing Gate Openers Online. The redesigned Liftmaster LA500PKGUL swing gate operator is UL 325 compliant and compatible with monitored safety entrapment protection devices. Buy Liftmaster LA412PKGUL Solar Swing Gate Opener Online. The new Liftmaster LA412PKGUL swing gate operator is UL 325 compliant and includes a monitored safety entrapment protection device. Affordable Openers is the main source for gate operator, automatic gate openers and gate automation equipment. Affordable Openers is a factory authorized and approved re-seller by all major brands.